You can elevate dishes like creamy soup, mixed salad and even pasta by adding some crunchy croutons as a topping. Best of all, they are easy to make. All you have to do is use a serrated knife and cut the bread into bite-sized pieces. You can season them with the likes of salt, black pepper and dried herbs like basil and oregano. Heat them up on a pan with oil or butter and fry them until golden brown. No, we don’t mean that “strata” commonly associated with the ownership of a property. This strata in question actually refers to the type of bread-based casserole commonly made with eggs and milk. Just place your leftover bread slices on a baking dish that has been greased with oil. Then, crack 2 or 3 eggs on a bowl and whisk them together with milk. Pour the egg mixture over the bread and cover the baking dish. Set aside in the fridge for at least 30 minutes or overnight if possible. The whole point of doing this is to ensure the bread would soak up all the flavour from the egg mixture. Next, preheat the oven to 180°C or 350°F. Remove the strata from the fridge and uncovered it. Layer some cheddar cheese and if you want more flavour, you can also grate different type of cheese blocks like parmesan and mozzarella on top of the strata. Once the oven is heated, place the strata inside and bake for around 25 to 30 minutes until the cheese is melted and turns golden brown. 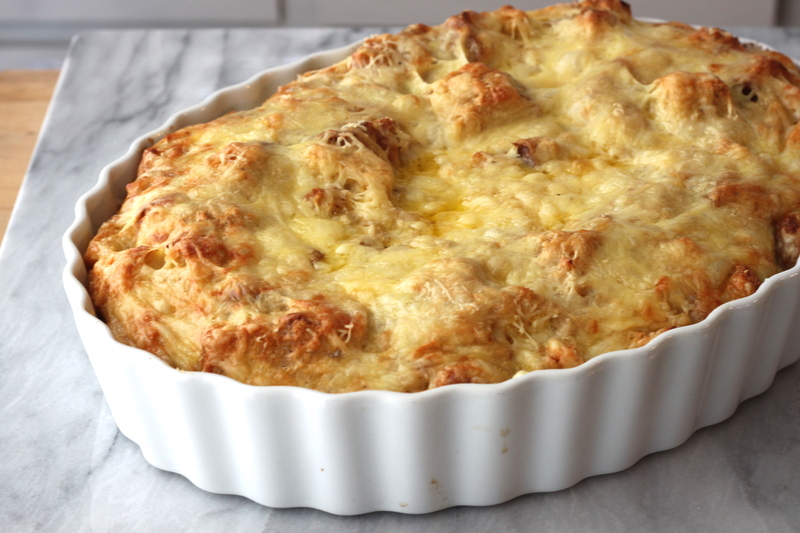 You can also add ham and sausage to turn your cheese strata into a fuller meal. Forget about the store-bought breadcrumbs. Save your hard-earned money by making your own using the leftover bread! They are just as good as a binder for meatballs or a topping for pasta. Simply layer the slices on a baking dish and place it in the oven preheated to 190°C or 375°F. Toast them for around 15 to 20 minutes until golden brown. Then, remove the baking dish and let it sit for about 10 minutes. In order to turn your toasted bread into crumbs, there are two easy ways you can do: cut the bread into pieces and blend them into a food processor OR place the bread in a sealed/ziplock bag and break them with a rolling pin or an empty glass bottle. You can use them immediately or store your homemade breadcrumbs in an airtight container or a resealable bag in the fridge for up to one month. Bread pudding can be served as a dessert or even a breakfast meal. Preheat the oven to 180°C or 350°F. Then, slice the leftover bread into cubes or tear them into pieces (you can choose to butter them first if you like). Place the sliced/torn bread on the baking dish and spread them evenly. Toast them for around 15 to 20 minutes until golden brown. Remove from the oven and let it cool. Whisk eggs, milk, cream, sugar and sweet ingredients of your choice (e.g. chocolate and vanilla) together in a medium/large bowl. Pour the mixture slowly all over the top of the sliced/torn bread. Just make sure it coats every single layer of the bread. Cover the dish with plastic wrap or aluminium foil and store it in the fridge for an hour or overnight if possible. All this is for the bread to fully absorb the flavour of the mixture. Finally, remove the dish from the fridge and uncover it. 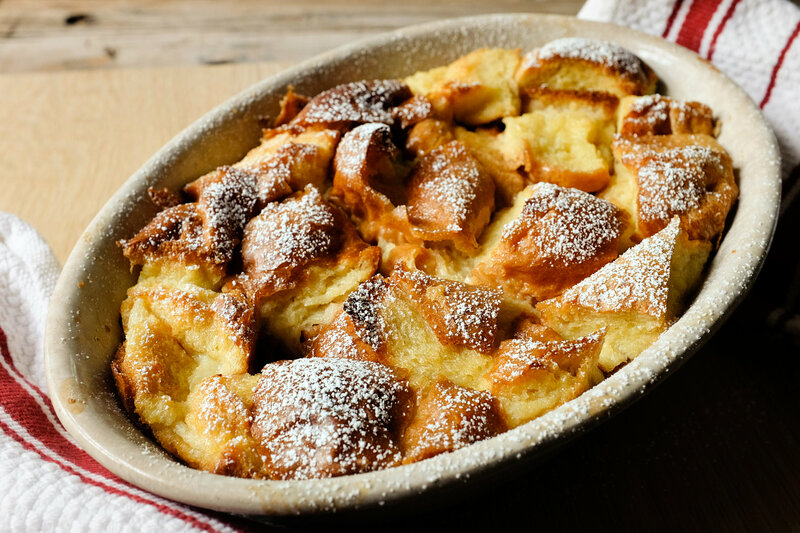 Bake the bread pudding in the oven preheated to 160°C or 325°F for about 40 minutes. A good bread pudding has to be crisp on the outside but moist on the inside. Transfer the pudding onto a wire rack and let cool for at least 10 minutes before serving. You can choose to top the bread pudding with icing, chocolate sauce, chopped berries/fruits or drizzle with honey. Ever try a bread sauce before? It is traditionally served during Christmas and usually eaten with poultry like turkey or roast chicken. But you can enjoy it anytime you like and it’s easy to make! Add 1 pint or 500ml of milk together with a bay leaf, onion (all peeled and cut) and cloves in a saucepan. Simmer and let it infuse for around 20 to 30 minutes. Next, prepare the leftover bread. Remove the crust and tear or cut the bread roughly into pieces. After the simmering is done, remove everything in the pan except the infused milk and add in the breadcrumbs. Return the pan to the heat and stir the breadcrumbs for around 3 to 4 minutes. Season it with freshly ground black pepper and a pinch of salt and keep stirring until your desired consistency. You can also add thyme, grated nutmeg and/or cream to help elevate the taste of the bread sauce. Previous articleCrocs Has Added a New Topping to Its Latest Footwear!